Planning for your dream vacation can be so exciting — where you’re going to stay, what you’ll see, the shows you’ll take in, all the amazing food you’ll eat. But what about all your travel documents? Are they all in order? Here’s a list of everything you need, plus practical tips on how to keep everything organized, safe, and accessible. Your passport. This is the big one. Make sure it hasn’t expired and is within six months of being expired. And don’t forget passports for your kid(s)! Any visas that can be acquired in advance, including those for countries you’ll only be traveling through. If you can’t get a visa in advance, bring the letter from the consulate stating that your visa will be granted upon your arrival (the UAE and Oman are two countries that don’t issue visas outside their countries, for example). A copy of the picture page of your passport, and extra passport photos. Originals and paper copies of your tickets (plane, train, bus, etc.) and confirmation numbers (hotel reservations, car rental, etc.) and all contact info for these companies. Contact info for all the people you would want/need to contact in case of an emergency (including me!). Don’t forget the numbers of the consulates where you’ll be staying. All these numbers can be stored in your phone, as well — simply designate a consistent label for them (like “France 2019”) for easy access, and they can be easily deleted when your trip is done. Copies — front and back — of any credit cards you’ll be taking with you. When you’ve assembled all the essential documents/copies, the first thing you should do is check to make sure your name appears the same on all documents. This may seem like a small thing, but it can be a big hassle during travel if your names don’t match. Next, scan the papers and send them in an email to yourself and to your emergency contact(s). In addition, you can carry a USB card with encrypted copies of all these images — so even if it gets stolen, no one could access the documents without the master password. You can keep this USB card in a tiny, discreet pocket, along with some extra cash — an absolute last resort in the extremely rare event that you lose everything. Choose a family member or close friend who will be your representative while you’re away and who can have access to major accounts if needed. This way, you have a trustworthy contact available any time, and there is someone who always knows where you are. 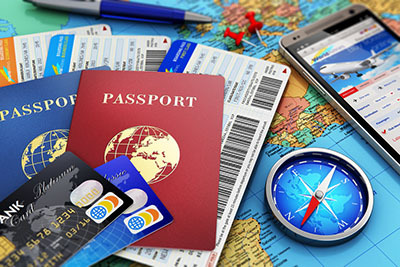 Store copies of your major travel documents (passports, tickets, reservations, etc.) in a waterproof plastic zip bag and in a separate piece of luggage from the originals. It’s stressful enough to have your passport stolen — but having it stolen from the same bag where all the copies are is even worse. When you’re out sightseeing, always carry the essential documents on your person, ideally in a waterproof carrier that can be worn under your clothing. Once you get all this info in order, you can travel with confidence, knowing you’re covered in the event of the unexpected. And — bonus! — you’ll have laid the groundwork for future trips. To start planning your trip today, contact me by clicking here. I look forward to hearing from you!